Trail Marathon within the fantastic Brecon Beacons. 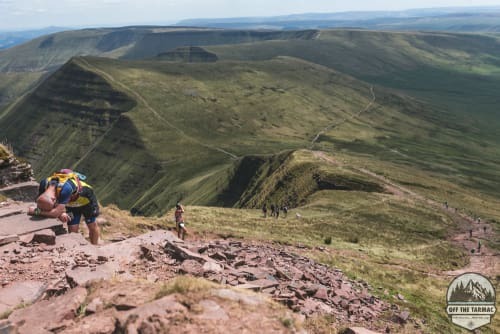 Start and Finish at Parkwood - this looped course takes in Pen Y Fan from Graig Fan Ddu before heading up Fan Y Big before heading over to Talybont Reservoir for the final climb up Tor y Foel. A love for the following are a must:- Mountains Trails Compulsory Kit Trail Shoes Mud Fun Free T Shirt, Cake and a medal included in price. This is the route (subject to minor changes) https://www.strava.com/routes/16103958 Checkpoints are at:- 7 Miles 14.5 Miles 20.5 Miles 1 cut off at checkpoint 3 at 16:00 Compulsory Kit:- Mobile phone -Fully Charged at start Hydration - Min 1 litre Foil blanket or Bivi Bag	Food & Emergency Rations -400 Cals emergency rations Basic 1st aid kit Compass - Map provided at registration Whistle Waterproof jacket and trousers with tapped seems Hat and Gloves Head torch or torch Price £40 affiliated £42 non-affiliated A range of accommodation is available onsite direct with Parkwood from camping to 4 star contact 01685 848309.